Chic Salmon and Cucumber Sandwiches for high tea. Quick and easy to make salmon and cucumber sandwiches that look amazing, sure to get your guests talking. Isn’t it funny when the main event doesn’t become the star of the show? 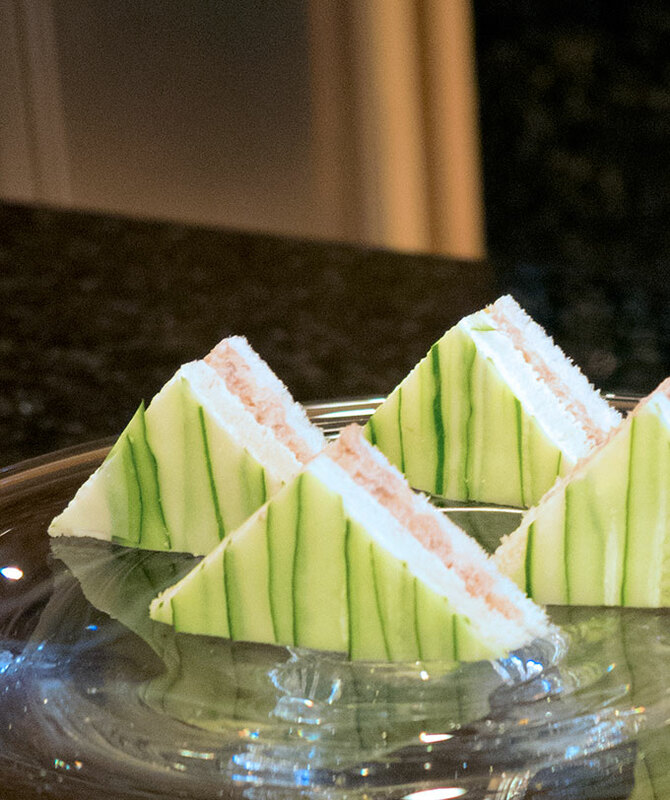 As soon as I saw these salmon and cucumber sandwiches at the Mandarin Oriental Taipei I knew I had to have a go at making them. I had finished a lovely lunch at the Mandarin Oriental’s swanky Cantonese restaurant Ya Ge and was on a fast paced hotel tour. The Mandarin really is a stunning hotel and Ya Ge’s food exceptional. 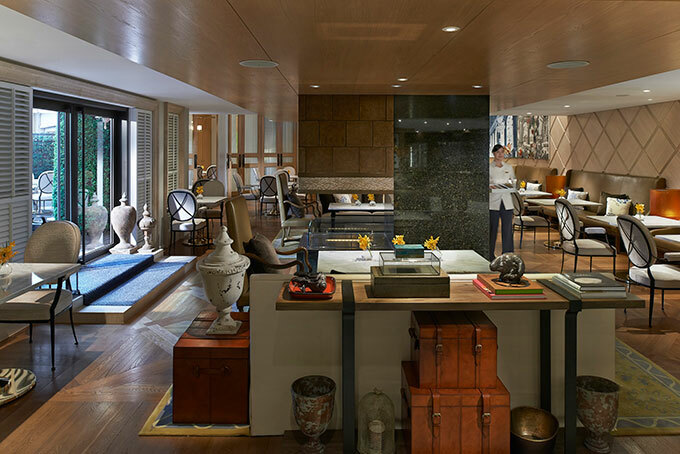 Part of the tour included the Oriental Lounge, an exclusive area for Club Floor guests. Here guests staying in Club rooms can enjoy breakfast, afternoon tea and cocktail hour. This is where I spotted the salmon and cucumber sandwiches. They were part of the complimentary afternoon tea spread for Club Floor guests. These simple sandwiches stole the show. It was the first time I had seen cucumber on the outside of a sandwich before, I thought it was a clever idea. A clever idea with a stunning result that is basic to make at home. Most high tea fare, even though small, can take time to make. 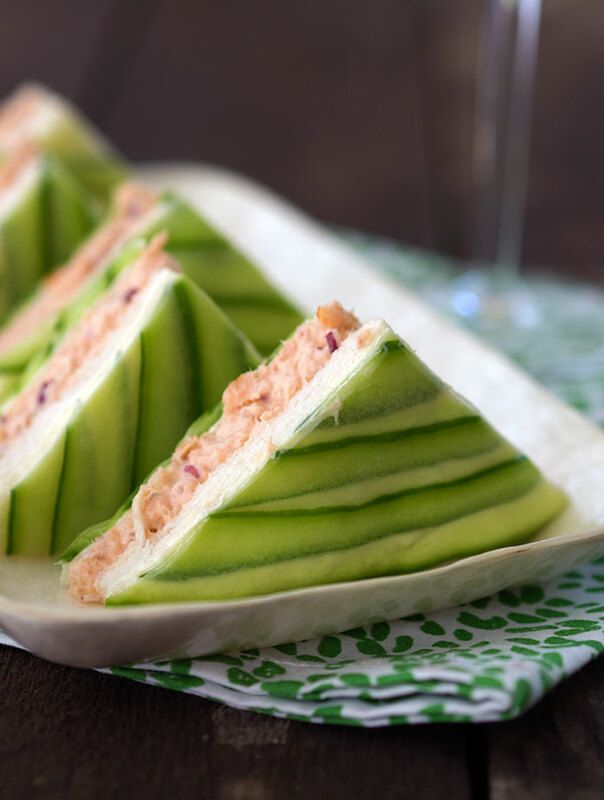 For the amount of time and effort that goes into making these pretty cucumber and salmon sandwichs, which is none, you end up with an eye catching sandwich. The perfect addition to a high tea selection. In fact they would be the perfect addition to a Melbourne Cup spread. Perfect with a glass of champagne, don’t you think? I use cream cheese as my “glue” to make the cucumber strips stick to the outside of the salmon and cucumber sandwiches. I feel it works best as it is white and matches the bread. It gives the illusion of nothing being there and lets the green of the cucumber stand out. Of course, you could use butter, but the effect won’t be as chic and clean looking. Also, you run the risk of the butter softening more than it should when the sandwiches are set out to be eaten. The result, cucumber slices sliding off and greasy fingers. Cream cheese is more stable. You are only limited to fillings by your imagination. Chicken, crab and prawn fillings would all be just as delicious. Even the cucumber isn’t sacred with these sandwiches, have a play around with alternatives to cucumber. I thought that toasted sesame seeds could be quite eye fetching and tasty with the right filling, what do you think? 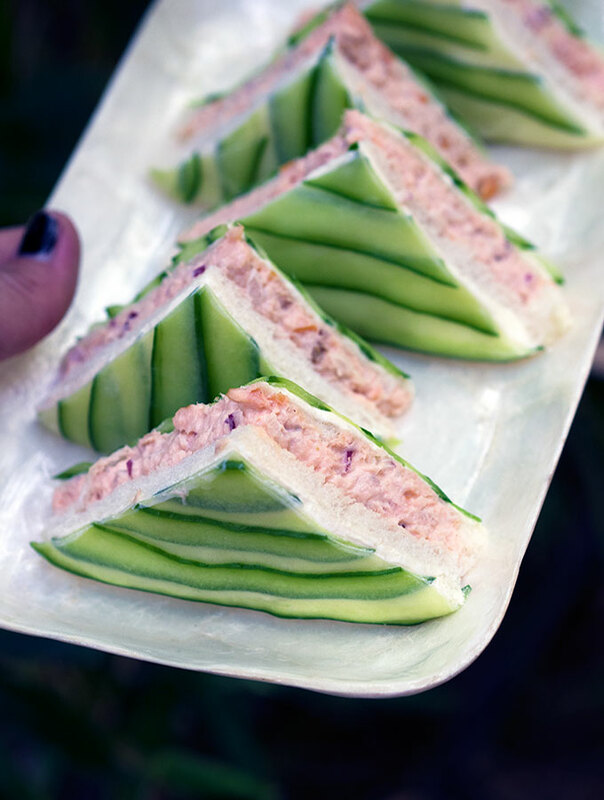 These chic Salmon and Cucumber Sandwiches are the perfect addition to an elegant high tea. Very simple to make with show stopping results. As seen at the Mandarin Oriental Taipei, in the Oriental Lounge. Note: Make sure that your cream cheese is at a consistency that will spread over the fresh bread without tearing. It is best to take it out of the fridge for 10 minutes before use. In a medium bowl mix smoked salmon, red onion, mayonnaise and lemon juice until combined. Add salt and pepper to taste. Using a vegetable peeler slice long thin strips lengthwise from the cucumbers. It is best to avoid using the core of the cucumber, which holds all the seeds. Pat cucumber strips dry with some paper towel. Spread cream cheese over a slice of bread. Lay the cucumber strips over the cream cheese, making sure they over lap slightly. Pat them down gently and turn the slice of bread over. The cucumber side becomes the outside of your sandwich. Repeat this step with the remaining five slices of bread. Spread one slice of bread, on the non cucumber side, with the salmon filling. Then place another slice of bread, cucumber facing up, on top of the salmon. Gently cut off the crusts and cut sandwiches into triangle quarters. Repeat with the remainder of bread and salmon. You will end up with 12 triangle sandwiches. You could also cut them in to fingers. Cut off the crusts as above, and then cut in to three even finger portions, you will end up with nine sandwiches this way. Hi looks great. Could I use smoked salmon cream cheese instead of salmon slices. Of course you can, you are only limited to your imagination on fillings! I am guessing these are best made the day of use because I imagine the cucumber outside making the bread soggy over night. I’m not sure though. Have any experience in making them the night before a party? Yes, they are best made on the day. I have never made them the night before as I like to use the freshest bread possible for finger sandwiches. There is a very high chance they will go soggy, from both the filling and the cucumbers, especially around the cut edges. I would suggest making them on the day. You could prepare the filling the day before and have that ready to go. You could also have the cucumbers slices ready to go as well. Then it is just a case of assembling the sandwiches close to the party. Do you peel the cucumbers first? From the photos part of makes the sandwiches so pretty is the strip of dark green on the outside of the cucumber strips. If you peel it I don’t see how that would be possible and if you don’t then once you use the first layer of cucumber there won’t be any more contrasting dark green. They look absolutely gorgeous and want to make them for a bridal shower. No don’t peel the cucumbers, you are right on your thoughts. Just wash and dry them well. I find it is best to use small Lebanese cucumbers and use a vegetable peeler to peel thin slices from the cucumber, you can also use an mandolin of course. Keep peeling thin slices until you reach the seed heavy centre of the cucumber and turn it over and start peeling from the other side. You want to avoid using slices with too many seeds as they contain a lot more moisture and will sog your sandwiches up. By peeling slices off the cucumber lengthwise you will end up with that dark green edge on each side of your strip from the cucumber skin. Then when you layer them on the outside of the sandwiches you get that lovely contrast. All the best for the bridal shower, I am sure they will be well received. Beautiful. Reminded me of growing up in Minnesota. My Mom made triple-decker salmon sandwiches with egg salad (and a few with cheese spread) for card parties. Elizabeth your mum’s triple deckers sound delicious! I am confused! Do you use two slices of bread on one sandwich? You seem to say you use two and then you say you only use one with the cream cheese acting like the second slice of bread. Your pictures also seem to show two slices in one picture and one slice in another. Please clarify! Sorry to confuse you. The recipe does mention 6 slices of bread and outlines the process of putting a sandwich together. You use 6 slices of bread which in turn will make 3 sandwiches, resulting in 12 triangles. The photo of the sandwich showing one slice of bread, is just a camera angle. The bread which sits on the bottom layer of the sandwich compresses a little when you cut them. Well they did for me as I was using super fresh bread. 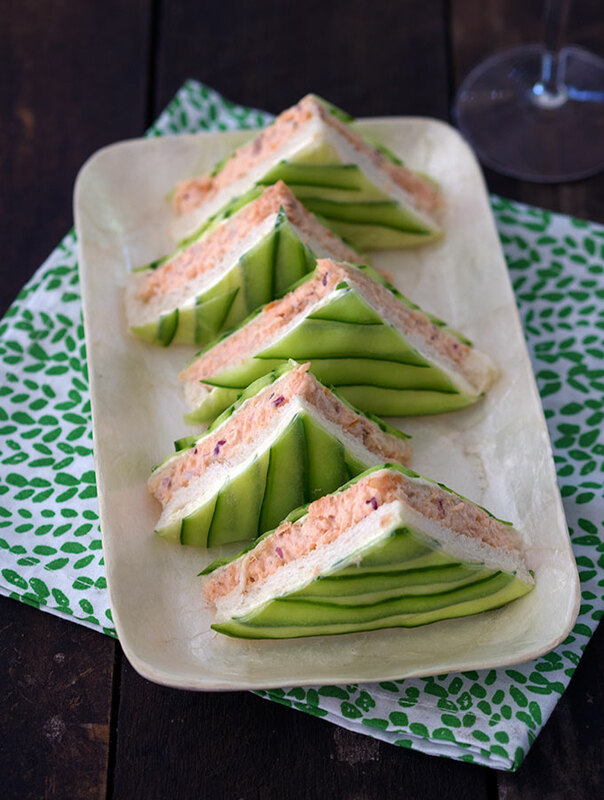 We invited friends over for an afternoon tea and in searching for ideas for tea sandwiches we found the photo of the Chic Salmon and Cucumber sandwiches and they look so elegant and appealing – just the thing to impress our guests. It was easy to make and assemble (the hardest part was to make sure the assembled sandwiches remained stable when trimming the edges and then slicing them in half). “Delicious” was everyone’s comment and they marveled how similar our effort was tho the photo. We will definitely add this sandwich to our repertoire for future read. Jeff I am so glad you enjoyed them and that they were a success. Yes, agree you need to take care in trimming the edges and cutting them in half, but it is worth the effort. These look amazing! Will try them for the holidays! These are so creative! I love that the cucumber is outside the sandwich, they look so much prettier this way!